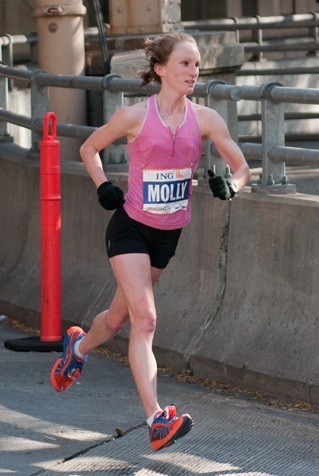 The Middle Miles: ‎Molly Pritz in 2:31:52 for top American at NYCM!! ‎Molly Pritz in 2:31:52 for top American at NYCM!! Molly Pritz just went 2:31:52 at the New York City Marathon, for 1st American and 12th overall! In her marathon debut no less too. Flotrack video after the break. She also now has an official Facebook fan page. If you're on Facebook, please add her! Definitely one of several to watch in a rather deep women's OT marathon field! Women's marathon OT is going to be awesome. Super deep field and lots of room for surprises. Men's should be a great race too. Other than Hall, I don't even know who the favorites are. Totally spaced out on this one. I just got power back again, a week without it. I enjoy checking out this marathon on TV. What happened to Hall? Congrats to Molly. Hall didn't run this race. Probably just training for the Trials.